The ice door does not close allowing warm air to enter into the freezer. What parts would I need and how do I go about replacing the door. I know I have to take the front panel off to start but I am having trouble getting it off without braking it. I don't see any slots on the bottom of the panel. The front dispenser frame assembly just pops off, look underneath the bottom of the lower dispenser frame, you will see 2 small slots, you then use a screwdriver to pop it off. If you don't see the 2 small slots, then remove your trip tray and you should see a couple of screws you can remove. You'll need a new ice dispenser door kit. I am having trouble getting the spring #4 and Pin #5 out. I have tried sliding the pin with pliers but the spring is so tight. I could try cutting the spring with pliers if I can get the pliers up there. Any ideas. 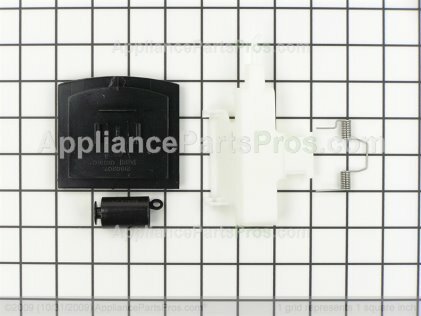 Also the new kit does not have the Heater Ribbon as it said on the parts details from AppliancePartsPros.com that the heater is no longer needed. Do I just unplug it from the control panel and leave it out?? Just keep trying Larry, you will get it. Try to push the pin out with a small pocket screwdriver. Or pry it out with something. Got the ice door replaced on the Kenmore Coldspot. Would not have even attempted it if it wasn't for the support and service you provide. The whole family is happy that it is fixed.